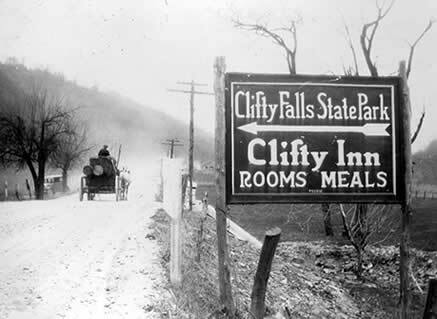 A sign beckoning visitors to Clifty Falls State Park, c.1920. Madison first developed as an Ohio River town and then transformed into a pork packing center with a bustling industrial center during the mid-1800s. By the turn of the 20th century, with most of the slaughterhouses and related meat processing industries gone and few industrial opportunities, Madison was searching for a new identity. The city began branding itself as a recreational destination as early as the 1920s. When Richard Lieber created the first Indiana State Parks to commemorate the State’s centennial in 1916, a group of Madison citizens decided to push for the creation of a local park. A long-time site for fishing, hikes, and picnics, the bluffs leading down to the Ohio River offered spectacular views and an ideal setting for leisure activities. Representative of the State legislature visited the Madison area and decided Clifty Falls, the site where Little Clifty Creek starts its descent to the Ohio River, would be Indiana’s third State park. For guests looking for less tranquility and more action, Madison hosted its first major regatta in 1929. Building on years of boat racing along the Ohio River, the Ohio Valley Motorboat Association organized the Labor Day Weekend events in which powerboats competed on a two-and-a-half mile course. The Madison Regatta soon gained a following and attracted teams from throughout the Midwest during its initial eight year run. Depression-era programs helped shape Madison’s 20th-century landscape. The Federal Housing Administration (FHA) was an agency created as part of the National Housing Act of 1934 to regulate interest and mortgage terms. During the mid-1930s, the FHA constructed model homes across the country. The simple, single-family houses represented the type of homes affordable through FHA programs and utilized local sponsors and donors for building materials and labor. During construction, the homes acted as demonstration sites where contractors or homeowners could learn basic homebuilding techniques and see how to install the latest home technology, including modern kitchen equipment and utility rooms with integrated mechanical systems. 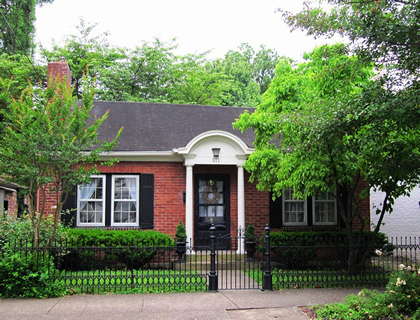 Madison was one of only two Indiana cities outside Indianapolis chosen by the FHA as a site for one of the agency’s model homes, a colonial-style residence built at 311 West Third Street in 1936. Clifty Falls State Park became the basecamp for Civilian Conservation Corps (CCC) and Works Progress Administration (WPA) crews during the late 1930s. Within the State park the CCC created trails and roads that complemented the site’s landscape, while the WPA constructed the Guthrie Memorial Entrance on the south edge of the park in 1938. 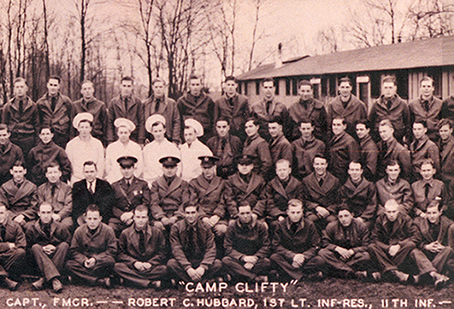 The workers got a special visitor when First Lady Eleanor Roosevelt toured “Camp Clifty” in the 1930s to see the two programs in action. The WPA also tackled a downtown riverfront lot left vacant after a major January 1937 flood destroyed the Trow Flour Mill. The agency’s Municipal Improvement section erected the Crystal Beach Swimming Pool and Bath House using stone from demolished 19th-century factories to create the building’s characteristic WPA appearance. At the height of construction, 70 men worked on the pool and recreation center. At the 1939 dedication ceremony, over 3,000 Madison residents attended a program including swimming and diving shows, speeches by city, state, and WPA officials, and musical entertainment, all broadcast live by a Louisville radio station. The Civilian Conservation Corps (CCC) at Clifty State Park. The Federal projects completed during the Depression could have some bearing on Madison’s next claim to fame during World War II. The Office of War Information selected Madison as the subject of its short film The Town (1943). The film was directed by Joseph von Sternberg, a well-known Hollywood director who had previously collaborated with Marlene Dietrich for seven films including The Blue Angel. Created as part of The American Scene series, the film depicted Madison as the model American town where citizens embodied American ideals and values. The Town was produced to be shown overseas to remind troops what they were fighting to preserve and to demonstrate American cultural values to foreigners. It was translated into 32 languages. The 1950s brought excitement to the sleepy Ohio River town. Boat racing was again an attraction with the return of small, locally-sponsored races in 1949. The Indiana’s Governor’s Cup, an officially sanctioned American Powerboat Association race introduced in 1951, elevated the level of Madison’s powerboat racing and became the basis of the annual Madison Regatta held over the Fourth of July Weekend. Hollywood again visited Madison in 1957. Movie director Vincent Minnelli chose Madison to portray the fictitious Midwestern town of Parkman in the film Some Came Running. The film starred Frank Sinatra and Dean Martin in their first film together and Shirley MacLaine in an Academy Award-nominated performance. During the three weeks of filming most of the cast and crew stayed at the Hillside Inn, but Sinatra and Martin rented the house next to the inn and constantly had to fend off overzealous female fans who would sometimes stand four people deep outside the stars’ windows. Movie producers and tourists alike have enjoyed Madison’s scenery and sites throughout the years. The same appealing assets that attracted people during the 20th century remain today. The combination of natural beauty and notable architecture continues to bring visitors to the area to hike Clifty Falls State Park’s trails, watch the Ohio Theater’s annual showing of Some Came Running, walk the tree-lined, architecturally distinct streets, or antique shop along Main Street.